Ø The Laser Lipo Diodes emit low level laser energy, which penetrates the skin to a depth of approximately 8-9mm. This is just deep enough to reach the subcutaneous fat layer. Ø The contents of the fat cells (Fatty Acids, Triglycerides and water) spill out from the broken cell membranes and are released into the interstitial space. This mechanism of action is not “liquefaction of fat”, it is the instant emptying out of the cells rather than the destruction of them. (referred to as lipolysis). Ø The intra-cellular fat causes the cell to lose its round shape by changing the permeability of the cell membrane. This does not affect the neighbouring structures such as skin, blood vessels, and peripheral nerves. Ø You undertake some form of (preferably cardio vascular) exercise to raise your heart rate, therefore increase your metabolic rate. Ø Your body will use the fuel available in your blood stream, which includes the Fatty Acids and Triglycerides released by the Laser Lipo treatments. Ø Once the “fuel” in the bloodstream has been used up, your Liver will begin to target the remaining fat deposits (starting with those most easily broken down - the treated areas) for further “fuel”. 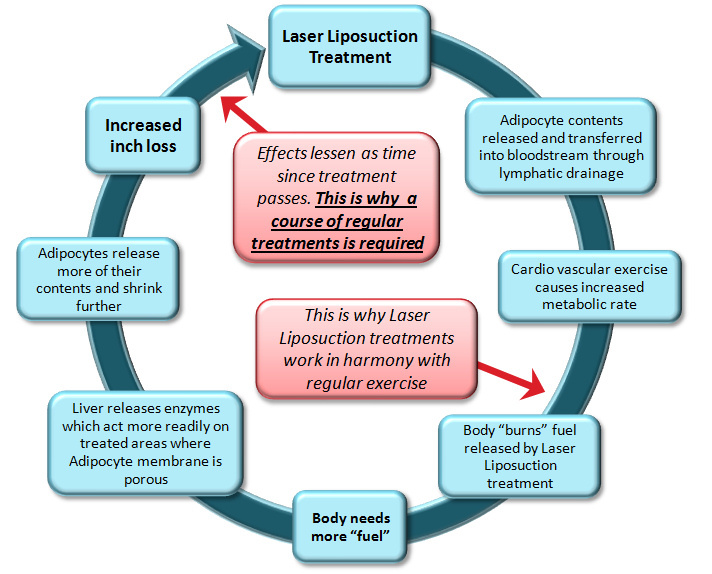 This is why we find Laser Lipo delivers amazing results for such a wide variety of clients, from Teens to Retired, Housewives to Body Builders – all walks of life!. To Achieve optimum results Laser liposuction should be used as one component of a properly monitored and healthy diet. The biological process that is set in motion and stimulated by the Laser Liposuction treatments forms a cycle. This starts with the treatments, working with the exercise you undertake and your body’s natural processes. Over time, the effects diminish and you need another Laser Liposuction treatment to maintain the cycle.